Ladies! Let's have some real girl chat for a quick second, shall we? What is it about tough breakups that make us say " F*ck it! " ... LOL! I mean seriously. A really hard breakup will have us saying, " F*ck him! ... And matter of fact? ... * Goes to the bathroom to get scissors* ... F*ck this hair too! I'm done!..." Ladies what is that about? LOL! Somehow, so many of us find this cathartic release in shedding our hair. How many of you have marked a new beginning or major life change via a cut or drastic change to your tresses? I know I have! .. grumbles ... stupid boys smh! At any rate, a few years ago, not long after the tears dried, I looked in the mirror and realized just that. I needed to find happiness and reboot my life, starting with something simple .. my hair. Up until that point I'd given up on relaxers (perms) as my sensitive but tightly coiled hair literally fell out in huge patches anytime any sort of chemical touched it. Instead, I'd been what I called a low maintenance natural. My hair virtually lived in various protective hair styles, which kept my real hair safely encased inside tiny box braids, Senegalese twists, various wigs, etc, for months at a time ... only handling it myself when it was time to wash. I basically lived at the local African braid shop. Cute right? I loved my look at the time, but staring in the mirror that day, I desperately wanted to shed it all and start over. I needed something completely fresh. Something that didn't remind me of some old version of myself. It was in that moment I decided to do something I hadn't done since childhood ... wear my own afro textured hair out into the world ... indefinitely. Up until that point, I'd been toying with the whole "natural hair thing," but what would it look like to fully commit? ... To be vulnerable and bare again ... To not hide behind large tufts of hair, but rather face the world stripped down to my essence? I wanted to reclaim myself, to feel pretty again ... and this felt like a really authentic way to do it. After having several bad experiences with hairdressers (even those claiming to specialize in natural, afro textured hair), seeking out a salon was out of the question for me. Besides, I'd been dependent on everyone else to care for my hair. I wanted the confidence and independence of being able to know how to work my own magic. 1st step involved doing what millions before me already had done, heading to Youtube and doing a bit of natural hair research. It was completely overwhelming, but I will say informational. During those early days what I did notice? All of the black and women of color who were successful in growing their natural hair rarely if ever wore hair weaves, small braids, or other forms of hair extensions. It was just these beauties and their healthy hair. That's it. Personally, this affirmed the choice I'd already made to rock my hair sans the extra stuff ... to be brave and let it stand all on its own. Only, there was one big problem. 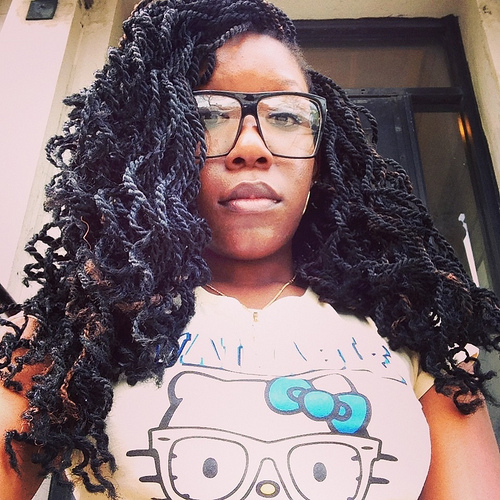 Having never developed what I affectionately call "the black girl gene for styling hair," I had absolutely no clue to where to begin style wise ... so I started with the simplest (and honestly the only) thing I knew .. Two-strand twists. At this beginning stage, my hair had been growing slightly over the years, but I noticed I'd lost the density and thickness I had in my youth during my un-permed years. Additionally, I realized the constant wearing of braided extensions had caused my hair to become uneven in sections, with damaged / frayed ends spread throughout. Stretched? It reached only just to my collarbone. I had already been natural for 5 years at that point, so I quickly determined that I had to be doing something wrong when thoughts of, "shouldn't it be longer than this by now?" started to form. Like myself, my hair needed to heal. Flash forward to today, I'm completely in love with myself again and beyond proud of my crown of full, healthy hair! In both cases, the journey of healing both inward and externally took time, but the beautiful end results are beyond what I could have imagined! After numerous requests, I've finally decided to document my personal hair journey! The beauty sections of this blog will document in full not only beauty practices from various cultures across the globe, but it will also outline my own beauty regimes and natural hair journey in it's simplest form ... from 100% natural products to the tangible cultural techniques I've mastered along the way ... because lets be real, no one has time to run a 30-step beauty regimen on the daily, right?! I know I certainly don't. After 10 years of learning my natural ... the latter 5 years spent diligently caring for and mastering my own hair properly, I've acquired so much knowledge through years of trials, error, & breakthroughs. Just like you, healthy hair has always been my goal. While I do not claim to be a professional cosmetologist, the steps I've mastered have grown my hair longer than it has ever been in my life ... PERIOD! From collar-bone length to mid-back. With 15 inches of hair and counting, I can definitely say I know quite a bit about growing loose (non - loced) natural hair. This special beauty series is the answer to the tips and tricks so many have asked me for ... it's yet another facet of my journey ... please join me & stay tuned as I give away all my secrets!